On the websites we've researched, False Confession Day is said to be a day where you are to make a false confession; as opposed to calling awareness to improperly obtained false confessions via heavy-handed law enforcement or government tactics. We've found no sources that identify the origin of this holiday which would help establish its true meaning. 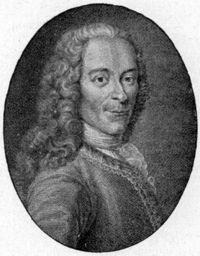 Though, we find it interesting that this date does happen to be Voltaire's birthday, born on November 21st, 1694, whom some believe made a false confession of his faith to the Church in order to get a proper burial. So we're thinking there could be a logical connection for this holiday to be tied to his purported false confession. If you do celebrate this holiday, we recommend that you carefully choose what to confess. We'd advise against celebrating this day by falsely confessing to a crime, planting a bomb or infidelity, as the consequences will most likely last far beyond day's end. We'd suggest something lighter, more on the humorous side, like confessing to being a closet Disco fan or that you're thinking of switching your chosen political party. This page was last modified on 21 November 2014, at 09:16.